You can quickly view an insurance plan note for an insurance plan attached to a patient's record and edit that note as needed, or if there is not a note, add one. You can view an insurance plan note when you are presenting a treatment plan to a patient with insurance coverage. You can also add and edit an insurance plan note by editing the corresponding insurance plan. A patient's Overview page - The Insurance box displays the patient's insurance plans, and an insurance plan note icon appears next to the name of each insurance plan listed. A patient's Insurance Information page - This page displays the patient's insurance plans, and an insurance plan note icon appears next to the name of each insurance plan listed. If the icon is blue , there is a note for the insurance plan. To view the note as a tooltip (only if you are using a mouse), position the pointer over the icon. To edit the note, click (or tap) the icon. If the icon is gray , there is not a note for the insurance plan. To add a note, click (or tap) the icon. 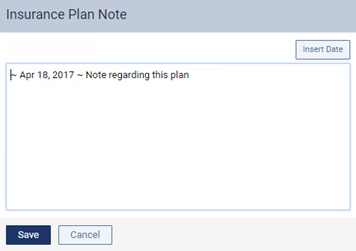 The Insurance Plan Note dialog box appears. Enter or change the text of the note as needed. The insurance plan note is specific to this insurance plan. You can enter text, such as information from an EOB or other document from the insurance carrier. Also, you can insert the current date if needed. The note is accessible from all patient records that have this insurance plan attached. Note: You can also access and change the note as needed from the patient record of this patient's subscriber or from the patient record of any patient who has the same insurance plan as this patient.